The architects Ilya and Emilia Kabakov imagined a vertical opera space of several floors to be built within a cooling tower at the Zollverein Colliery in Essen as part of their “Palace of Projects” scheme. On each floor different music is played, and the audience ascends a musical and visual spiral of experience until reaching a top attic space where the “show” ends and the audience descends another spiral to the exit. During the ascending sequence, the audience experiences different tensions according to the colouration of the ceilings which lighten as the observer/ listener continues upwards. A rather special experience terminating in a blue sky with white clouds before the attic. There is of course music on each floor. Whilst not wishing to inflate this duo music for voice and bass to operatic proportions, it occurred to me that there is in many ways a “spiral of experience” with this music offering a kind of narrative as the concert progresses. Each piece has its own expression but sequenced in the sense that the progression of the music is closely linked with the previous interactions - an unfolding within the Bimhuis theatre space, where the concert & recording took place. A con- tainer for the narrative. The principal improvisations (first to fourth Sky) are at times followed by loosely arranged material relating to traditio- nal songs ( Sumiglia from Corsica and Nani Nani , a Jewish/Spanish melody) and one from my pen (The Ancients). Questions may be asked why this analogy between an architectural space and a concert performance should interest anyone. Perhaps it is a way to describe a process, to pass on an experience that Savina and I went through in the creation of this music - a process that seemed to incrementally elevate us upwards in terms of our communication. A skywards spiral of invention, but above all simply a chance to sing and play music together and it seems appropriate that the final encore track “Attikos” not only refers to the spiral's apogee but also to the form of Greek used by the ancient Athenians. Live, ohne doppelten Boden, ohne Aufnahmetricks wird diese vom Maya-Label des Bassisten Barry Guy gemachte CD dem geneigten Hörer präsentiert. Dabei wirken die modernen Improvisationsstücke wie in Stein gemeißelte alte Findlinge. Yannatou, Stimmakrobatin mit gut geerdeter Verbindung zur Tradition, beherrscht das ganze Repertoire des modernen stimmlichen Ausdrucks. Begleitet wird sie vom Ausnahmebassisten Barry Guy, der natürlich wie immer alle Register seiner fulminanten Technik zeigt. So entsteht eine sinnliche Zeitreise in attische Seelenlandschaften. Jedes Stück ist eine in sich ruhende kleine audiophile Kostbarkeit, die ein schwereloses Schweben über den Klippen des Seins suggeriert. Spröde, nackte Schönheit. Wunderbar! 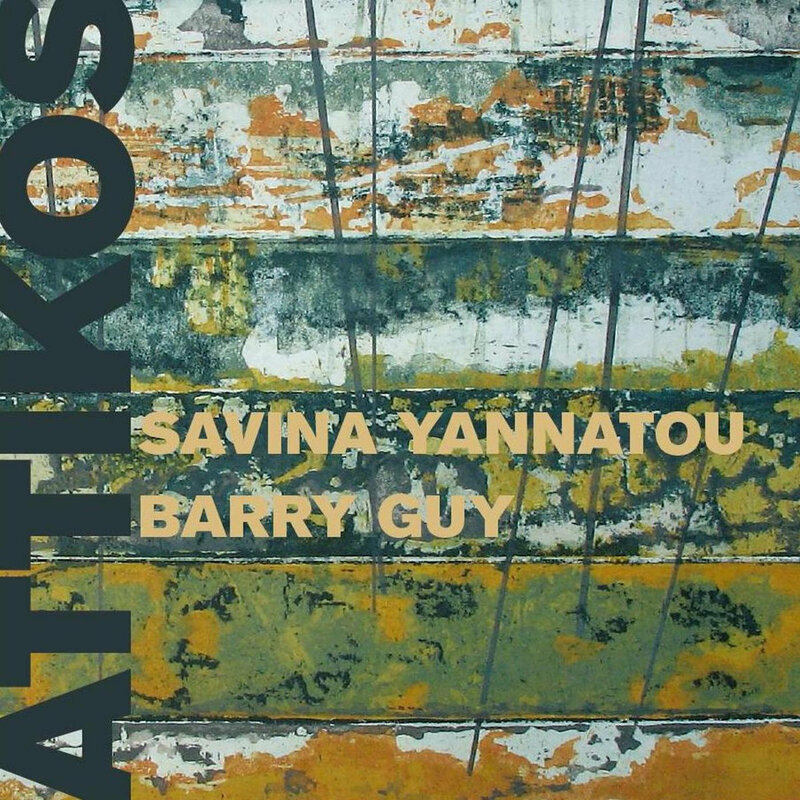 Attikos she joins veteran bassist Barry Guy for a live set of originals, covers and free improv recorded at Amsterdam’s Bimhuis. Working with the visual metaphor of a skyward-spiraling performance space with new music on each floor, the powerful set begins and ends with amazing empathy, bassist and vocalist mirroring, shadowing and completing each other, without overt imitation, like the intercoiled snakes of Mercury’s staff. Yannatou alludes to greater Greece in its various guises: keening throatsung harmonics throughout the improvised tracks; the poignant “Sumiglia”, a traditional Corsican melody; the Sephardic-flavored “Nani Nani” and the garbled glossolalia of her scatted ‘languages’.